This win doesn’t come out of nowhere. The CA100 coalition (CA100.org) has their fingerprints all over this success. CA100 is a coalition of clean energy advocates, environmental organizations, environmental justice and equity groups, health experts, union representatives, religious leaders and many other California stakeholders. They have built significant statewide support for California’s leadership in the transition to 100 percent clean electricity. 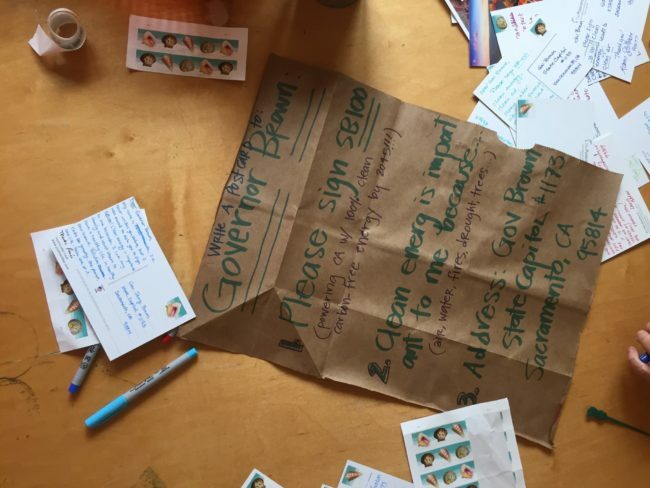 The coalition drove more than 70,000 calls, emails, postcards, petition signatures and in-person meetings with Assembly members in support of SB100. It takes a state. It takes you and me and everyone we know. We’re on the home stretch. Don’t quit now. If you’re interested in breathable air, water to drink, trees in the mountains…if you’re interested in setting a trend for the rest of the country, tell Governor Brown to sign SB100. Take one (or more) of these actions NOW. And when the Governor signs the bill, you can pat yourself on the back, throw your arms around all the other players who were in the room when California took the lead on 100% clean energy. Thank you in advance! Thank you for this rousing piece!! I love that you put being part of something big and widespread as the exciting part, rather than being the most visible leaders. Thanks again! Agreed! Such great insight into the process behind what made this possible – thanks for leading the way California!